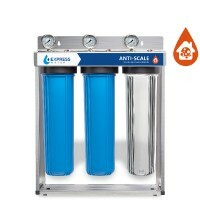 Protect your home, health, and appliances by filtering all of your water. Three stages of water filtration removes major contaminants and makes clean water for cooking, showering, drinking, and anything else. Use a simple, easy-to-install whole house water filtration system with virtually no loss in water pressure.